My mother used to say that when Iwould head out after school to bass fish in nearby ponds. It was her way ofsaying I should be back at our house shortly after dark. That was okay by me because thosefarm-pond largemouths usually went on a feeding spree during the magic hourjust before sunset. On a good afternoon, I’d catch a dozen or more in the houror so I had to fish. Among them were some of the biggest largemouths I’vecaught during 50 years of bass fishing. On weekends, I fished throughoutthe day and frequently caught bass when the sun was still high. These bass wereharder to catch, however. They usually held tight to cover in bits of shade,and pinpoint casts were needed to coax them into striking. They usually werefarther offshore, too, sometimes beyond my casting range, for at that time, Ididn’t have a boat from which to fish. I had to stand on the bank or wade theshallows. And on bright, sunny days, the fishing in my narrow shorelinerealm—the catching, at least—usually was poor. Things changed, however, when thesun dipped low on the horizon. As the sky transformed from robin’s-egg blue toa neon palette of violet and tangerine, the bass moved from deep daytime hauntsback to shoreline shallows where they were easier to find and catch. Pinpointcasts no longer were necessary. I could fish with the “cast fast, casteverywhere” frenzy more suited to my teenage demeanor, and the bass seemed tolove it as much as I did. When I remember it now, I’m gladmost of my fishing time was confined to late afternoon. I learned early thatthis is a superb time to be on the water. So when I left school and got a job,and most of my bass fishing time was confined once again to the hours near dusk,I didn’t see this as a disadvantage. This was the best time to fish anyway, soI hadn’t missed a thing. I’d sneak off to a pond or local lake as soon as I gothome, and from the time I reached the water until the time the sun set, I enjoyedenough action-packed bassing to keep me happy another 24 hours. In later years, I didn’t have toreport to work until 9 a.m., sometimes later. It was then that I startedfishing around dawn as well as dusk, and I learned that bass angling during theearly morning hours can be superb, too. The sunrise bite usually startsas soon as the sky begins to lighten and lasts an hour or two. Feeding activitytypically tapers off soon after this. Time it right, and you may catch morebass in the couple of hours around daybreak than you will the remainder of theday. I still prefer fishing during thehour or two just before sunrise or sunset. I’ve caught more bass at thesetimes, and more big bass, too. And it’s during these periods I most enjoy beingon the water. I like fishing with a glorious sunrise or sunset for a backdrop.I like being there when the wind is calm and the water’s mirrorlike surfacereflects the trees and other shoreline features. I like watching baitfishdimpling the surface as the bass herd them through the shallows, and watching alargemouth explode beneath a topwater cast to the spot where I just saw himfinning. There are additional reasons whyyou, too, should consider fishing more around dawn and dusk. Consider, for example,the sun/shade factor. Bass move to darker areas when light is bright,especially when they’re in a feeding mood. In lakes with weeds, they move intoweed beds instead of prowling the edges. In shallow lakes and ponds, they moveinto thick woody cover. In clear, deep lakes, they go deeper, and they oftensuspend. You can catch them, but you must work harder to do it. The reasons bass seek areas ofdarkness during periods of bright light are simple. First, bass have noeyelids. They cannot blink or close their eyes. For this reason, bass must avoidexcessively bright light by going deeper or into shade. This also is one reasonwhy schooling bass in bright, open waters in midday come zipping up to slashschools of baitfish but go down very quickly again. Bright light handicapstheir vision, just as you would be blinded by stepping suddenly from a darkroom into the sunlit outdoors. In bright light, largemouths arereluctant to expose themselves for another reason, as well — it could hampertheir feeding success. Ambush predators such as bass are more visible to theirprey in full light, so stealth is impossible. Also, glaring sunlight makes itmore difficult for bass to sight their quarry. Most will move into areas ofshade, where they can see best, hide best and be most comfortable. Forage species—everything fromminnows to frogs to crawfish—also move to shady areas. Thus more food is in theshade or moving about seeking shade. Forage animals moving from bright to dimlight also have difficulty adjusting to the new situation. The waitingpredator—the bass—is thus not so easily seen until it has made its strike. Manystrikes are misses, however, because the bass must rush out from shade intobright light. Conditions are much differentaround sunrise and sunset. Glaring overhead sunlight is replaced with lightthat is more diffused and evenly spread. Bass are not possessed by the urge tofind shady spots now, for there is no shade. Everything is more evenly lit,with little contrast. Bass now feed just as well by prowling as by lurking indarkness, so they’re more widely dispersed. Fishing strategies such as flippingand pitching, which focus on specific pieces of cover, become less effectivethan shotgunning casts with fast-moving lures such spinnerbaits, buzzbaits andcrankbaits. 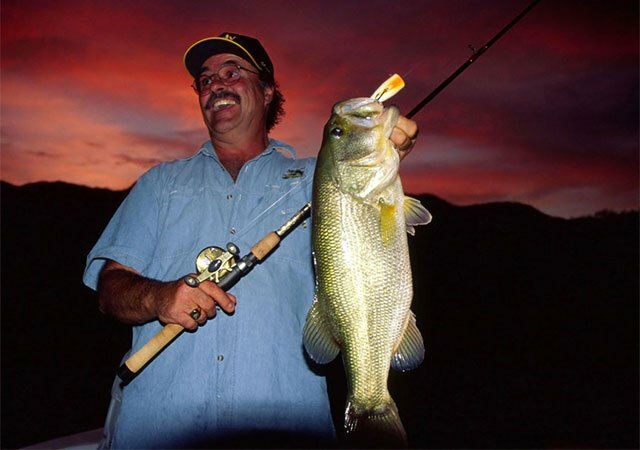 If you’re a topwater buff, youcertainly should consider fishing more around dawn and dusk. Bass are morelikely to be feeding topside because light is less intense in the surfacestrata, allowing bass to better appraise shape and color. This is one reason somuch surface activity occurs near dawn and dusk. Bass can see with more claritythan at other times. The accuracy of their strikes improves. Dawn and dusk also are the timeswhen the surface is likely to be most calm. Bass that previously were invisibleas they lurked in deep water or shade now can be seen as they chase bait in theshallows. The angler can sight-cast to them with lures mimicking the prevalentforage. What lures should you use forduring these times of day? Spinnerbaits and crankbaits work very well, but myfavorites this time of day are topwaters—any lure that burps, splutters,gurgles, spits or hisses, from prop baits to chugger plugs and buzzbaits tosoft-plastic rats and frogs. Largemouths are in the shallows eating. These fishseem more ravenous and willing to travel farther to take a lure. Thus, topwaterfishing is at its best. Whatever lure you use, work it inshallow waters near shore. Sight-cast to bass seen running shad, minnows orother baitfish. If no activity is apparent, then dredge the waters aroundstumps, stickups, points and other features of cover and structure along thebanks. Most of all, enjoy yourself.Maybe you’ll catch fish, maybe not. But you can certainly enjoy these beautifultimes of day when fishing is most pleasant.